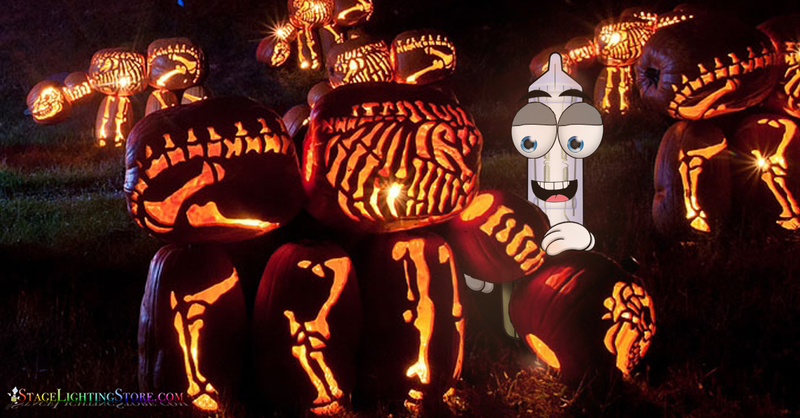 The origin of one of our most decorated holidays, Halloween, dates well back into the fifth century BCE. It emerged from the Celtic celebration of Samhain held in late October during which light in the form of fire played a central roll. Samhain was the night to honor the dead and the huge bonfires which were lit provided the light to aid the dead souls on their way to their ultimate destination. In the morning after the celebration the Druids, Celtic priests, presented each family with a still glowing ember from the bonfire, the purpose of which was to reignite their home cooking fires. 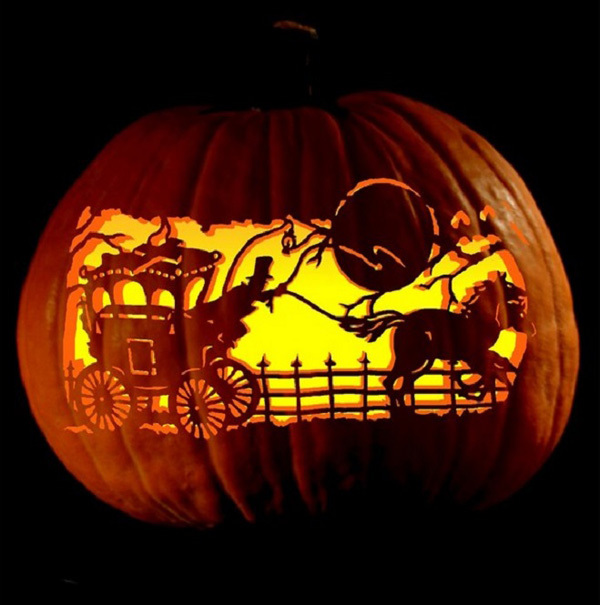 The hot, shining coal was carried home in a carved out turnip which eventually became the most renown Halloween decoration, the Jack-o’-lantern. 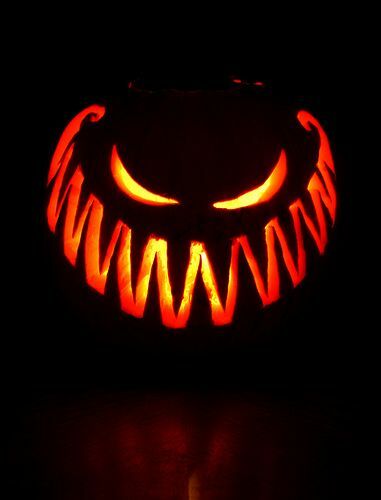 The naming of this carrying device as a Jack-o’-lantern also is rooted in Celtic, mixed with Christian, history. According to folklore, an inebriated farmer named Jack played a trick on Satan. Because of this action, Jack was turned away from both Heaven and Hell when he passed away. Doomed to walk in darkness, Jack’s soul fashioned a lantern from a turnip and a clump of burning coal Satan tossed to him from Hell. 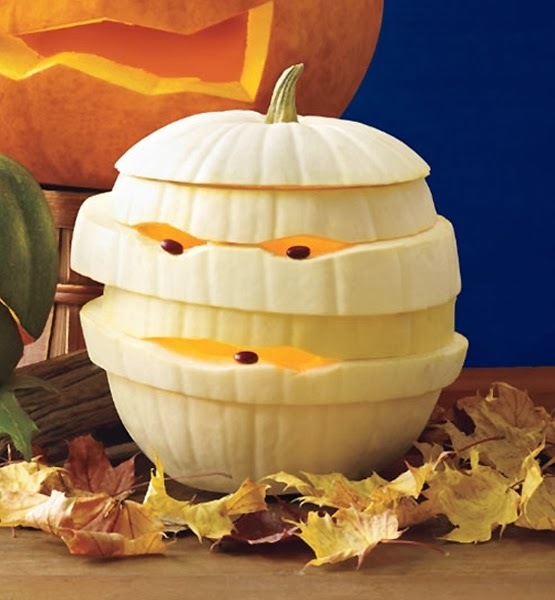 From then on the carved-out, lit turnips were called Jack-o’-lanterns. Around this same time in Celtic history a group of costumed Celts were celebrating Samhain by dancing around a gigantic bonfire carrying heavy staffs covered with burning hay torches. As seen by a Christian priest the dancers were backlit by the full moon and bonfire and appeared to be flying thru the air on broomsticks. Hence, our tradition of witches on broomsticks on Halloween. When in 1846 the potato famine in Ireland sent boatloads of Irishmen immigrating to the United States. The witches on broomsticks tale and the turnip Jack-o’-lanterns came with them. 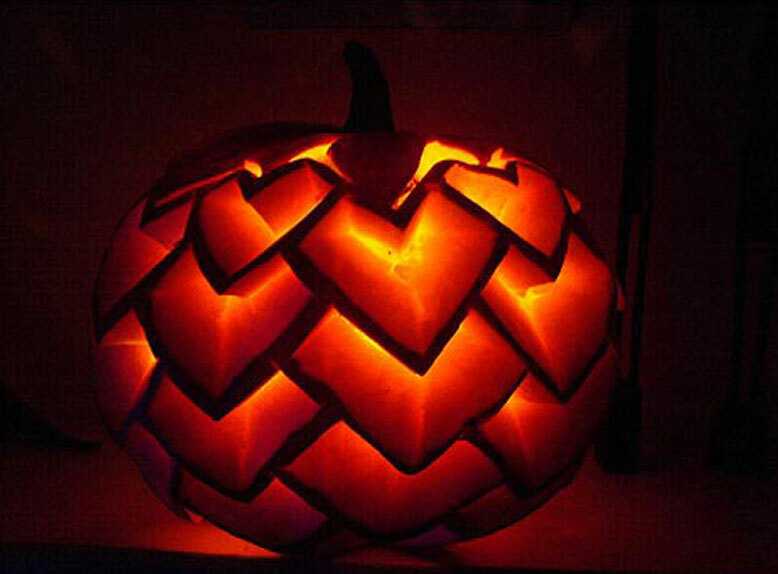 After arriving in the United States, the Irish turned to the more plentiful pumpkins to carve their lanterns. Not only were the pumpkins more numerous but they also were considerably easier to cut. 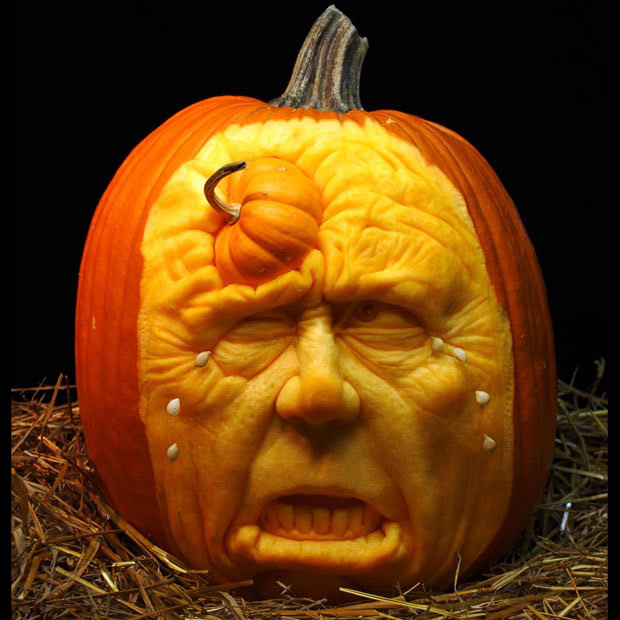 Nowadays the Jack-o’-lantern has become such a decorative item that contests are held for the best and most interestingly carved pumpkin. 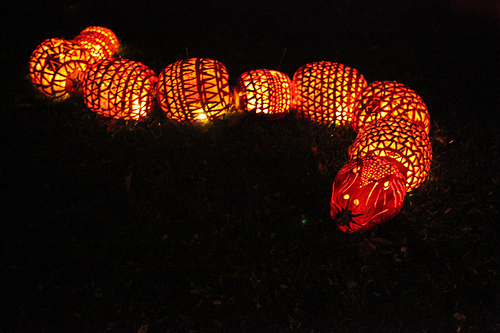 In the Roger Williams Zoo in Providence, RI an exhibition is held during the fall with thousands of these painted, carved gourds lining the pathways. Although Halloween had been quietly celebrated since the vast Irish migration into the United States, the first sanctioned municipal celebration was held in Anoka, Minn and occurred in 1921. The 1920’s and 30’s found community secular Halloween masquerade parties and celebrations increasing. Trick or Treating began in the 1950’s. 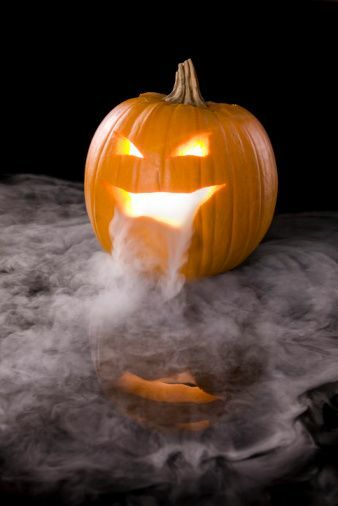 The great explosion in Halloween decorations only began, however, with the advent of plastics in the 1960’s. One of the most interesting of the new decorations involving lights (lamps?) is the development of the Glow (Glo) Stick. Development of these was begun by the US military in 1962 which was looking for a compound with luminescent properties that would work in extreme temperatures. The experimenting of many other scientists was required, however, to develop the Glow stick the is now so popular. 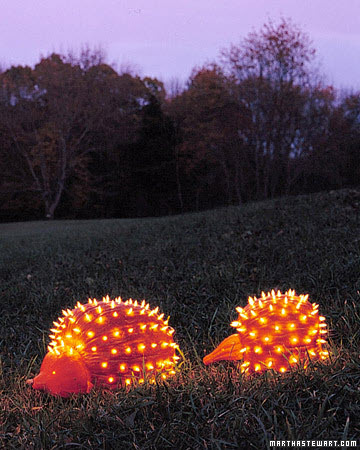 The Glow lamps’ uses for Halloween are many and varied. They are portable, light weight, inexpensive, and provide cool illumination for costumes and decorations. 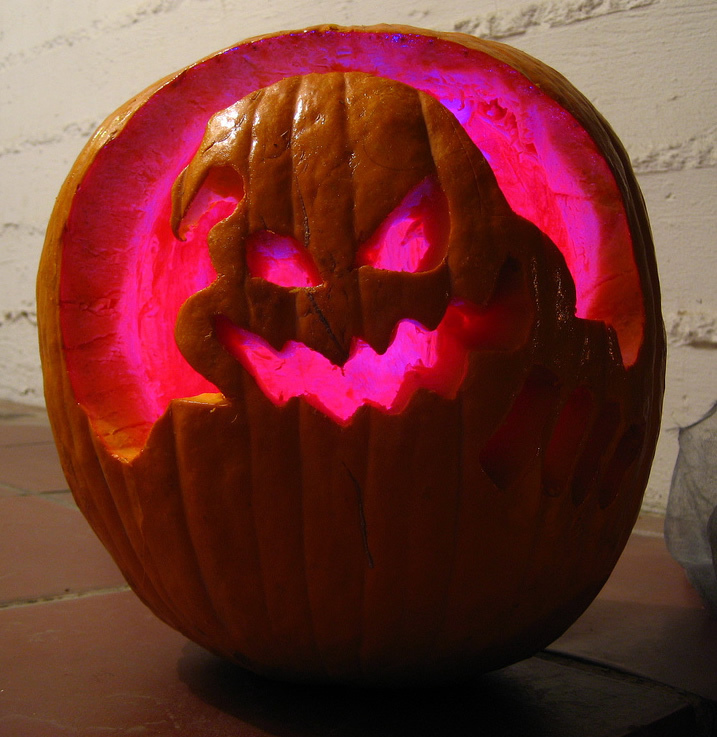 Parents appreciate the safety aspect of a Glow light decorating a costume or being placed in a Jack-o’-lantern instead of a burning candle. Now, as our technology exponentially expands, holiday decorating is only limited to imagination and pocketbook. 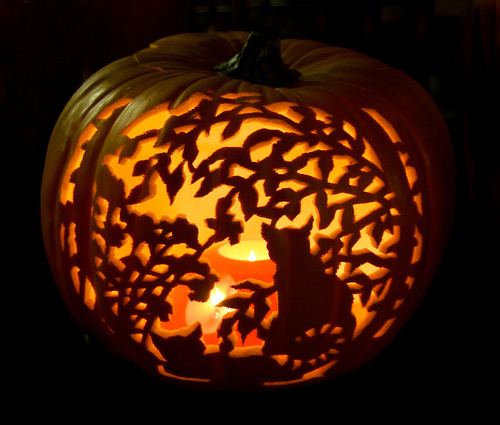 Here are some more examples of wonderful artistic pumpkins with light!